I have just recently discovered Wardrobe By Me - and there are some really great patterns in the range! I was very lucky to be selected to test the new Mirri Wrap dress - I loved the look and the flattering style as soon as I saw it, I knew it would be my sort of dress! The dress is designed to be made using lightweight jersey knits, so it's an easy comfy pull on style. As with most knits, you get a lovely flowy drape to the dress, which I love! The waistline sits just above your natural waist, making it really flattering, along with the pretty detail of the asymmetric pleats, this dress is very feminine. Depending on your fabric choice, you could make it smart enough for work, or dressy enough for an evening out! 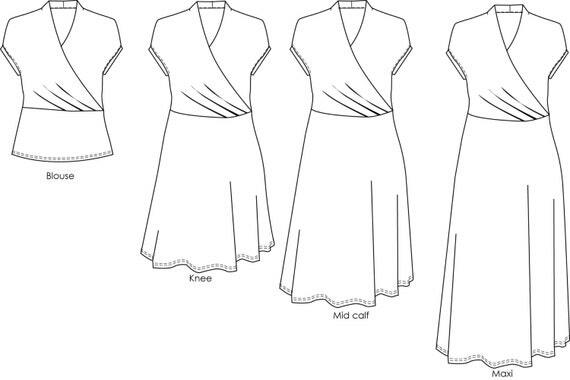 The shawl collar and sleeves are all in one with the front/back bodice - so this pattern only has 5 pieces, and it's really quick to make! You can choose to only print the size you need with the layers feature, which also helps to speed up the process of cutting out. The dress has a fit and flare skirt, which is really easy to wear and suits all shapes and sizes. The pattern is available HERE and comes in sizes 2-16 (EUR 32-46) and you can use the code 'sister' for 25% off ALL patterns! Check out this blog post to find out more about Wardrobe Be Me - the designer has TONNES of experience, so it's awesome to be able to sew up some of her lovely designs!